CJ Flag & Son is proud to be a supplier and installer of the finest quality US Flags as well as state, foreign, historical, military, POW/MIA and other service flags. We also furnish custom flags for businesses, organizations and municipalities. CJ Flag & Son also supplies a complete line of decorative and advertising flags and banners for grand opening promotions and other display uses. For waterfront areas we can provide a complete line of nautical and code flags to complete your nautical pole display. How Long Will an Outdoor Flag Typically Last? The US Government expects a flag that is flown from sunrise to sunset each day to last only about 90 days. In some cases, flags that have been flown 24 hours a day without being taken down at night have been found to last only one quarter as long as flags that are only flown during daylight hours. And of course, inclement weather and high winds also have a big effect on how long your flag continues to show its true colors. Because displaying an outdoor flag is not just a matter of “fly it and forget it,” it might be a good idea to purchase 2 or 3 flags and rotate between them. It has been found that periods of rest are beneficial for the fibers of the flag and can help it to last longer. Proper care and maintenance can also help you get more use out of your outdoor flags and banner flags. 1. Don’t fly your flag during periods of heavy wind, rain, or snow. 2. Don’t fly your flag when it is wet! The water can make the flag much heavier than usual, putting pressure on the seams and fabric and greatly reducing the lifespan of your flag. But also, don’t roll up and store a flag when it is wet. Spread it out to dry before folding or rolling it up. 3. If you won’t be illuminating your flag, there’s no reason to fly it at night. Take it down and let it rest. 4. Airborne environmental contaminants such as dust, smoke, and dirt can accumulate on your flag and even “set” in the fabric if left there long enough. To keep your flag’s colors bright, give it a bath periodically. You can wash an outdoor flag such as an American flag in mild detergent, then spread it out to dry. Carelessness and neglect are the biggest causes of flag deterioration, with sun and wind close behind. Luckily, a little care and maintenance go a long way to keep your flag looking great. Whether you need one flag or thousands, CJ Flag is your complete source for all your flag needs. We especially take pride that all our US Flags are proudly made in the USA and never imported. We are proud to serve Lindenhurst and the surrounding areas with the best in flags, flagpoles and other products such as high quality mailboxes and awnings. 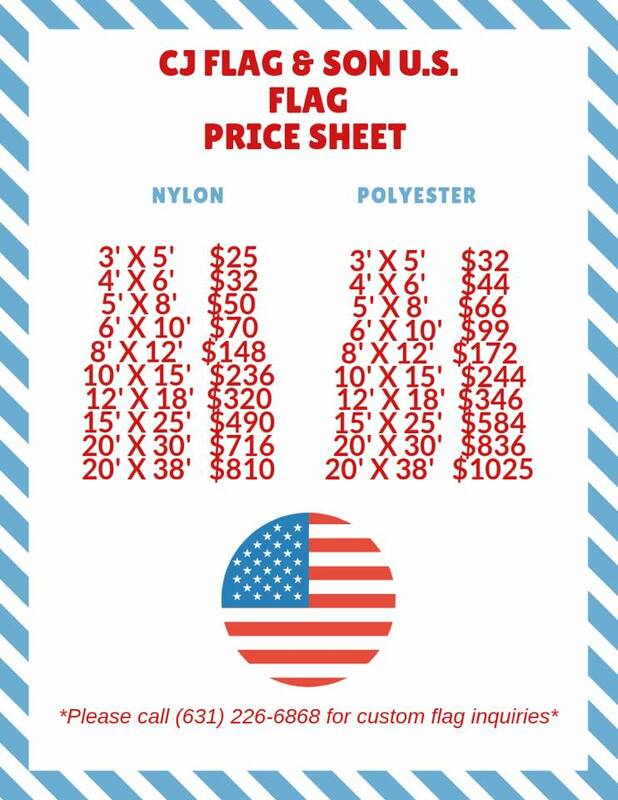 Give us a call to find out more about flag and flagpole size, pricing and installation.